- Tie and identify bundles of cable in one operation. - Large flat area for imprinting or writing the required information. - Hot stamping available, which is subject to minimums and lead times. - Label may be imprinted or written with marker pen. We are well known supplier for our product Nylon Marker Ties. We are well known in the market by our own brand name Jigo. Tie and identify bundles of cable in one operation. Flat areas may be imprinted or written on with a marking pen. 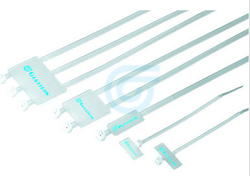 Matching up with the exact requirements of customers, we are involved in presenting wide array of Marker Cable Ties. Price Range : 0.60 Paise to 15 Rs. We are affianced in providing a wide range of Marker & Flag Cable Ties to the clients. Further, these products are manufactured using the latest technology and advanced machinery. 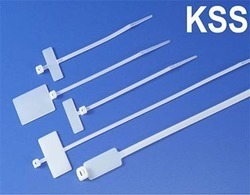 These Marker & Flag Cable Ties are highly reliable as these are fabricated using optimum quality material. Available at market leading prices. We are Looking for buyers Majorly from nearby Mumbai Only. With enriched industrial experience and knowledge, we are trading a wide assortment of Cable Tie.